Children of all ages are constantly learning and developing. Without clear vision, these necessary parts of life may not advance as efficiently as possible. As your child grows up, you want to maximize his or her potential, and regular eye exams are essential for reaching this goal. An undetected vision condition can severely impact your child’s ability to read, write and comprehend information. At Eagle Mountain Family Eye Care, we perform expert, comprehensive eye exams on kids, from babies to teens. Healthy, functional eyesight and sharp visual skills are critical for helping kids learn well and reach the top of their Fort Worth class! 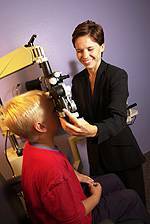 When does your child need comprehensive eye exams? If your child doesn’t need eyeglasses or contact lenses, follow-up exams during school years should be done every 2 years. If vision correction is required, then yearly exams are indicated. What happens during a kids’ eye exam in Fort Worth, Texas? To begin, we’ll spend some time getting to know you and your child. Our optometrists will ask you questions about family eye history, your child’s medical history, allergies and any current medications. You’ll also be encouraged to share any concerns that you may have about your child’s vision, and we’ll answer your questions patiently. The next step includes a general assessment of your child’s visual system. This includes evaluating near and far visual acuity, eye mobility, eye-hand coordination, eye teaming (binocularity), accommodation (focusing) skills, peripheral sight and color vision. Are you concerned about how we’ll test visual acuity accurately if your child hasn’t yet mastered reading the alphabet or numbers? Or perhaps your child is too shy to respond to our eye doctor? Neither of these issues pose a problem! We will pay special attention to visual acuity, as diagnoses of astigmatism, nearsightedness and farsightedness are very common during these years. We’ll also closely examine eye alignment and ocular health to look for any abnormal signs. A high powered lens will be used to inspect the retina. Refractive errors are definitely the most typical ocular problem amongst children. Other usual diagnoses include trouble with focusing, binocularity/eye teaming problems and convergence insufficiency. When left untreated, all of these conditions may interfere with basic learning skills, such as reading and information processing. When strabismus is detected, which refers to an incorrect positioning of muscles in the eye, eye exercises or surgery may be advised. If left without any correction, amblyopia may develop – commonly known as “lazy eye”. Amblyopia is often helped by patching the dominant eye in order to strengthen the other eye. After we check your child’s eyes in Fort Worth, we’ll review and discuss the results of our comprehensive eye exam with you. Together, we’ll determine the best treatment for your kid’s vision and lifestyle. We offer free eye exams for babies under one year of age.